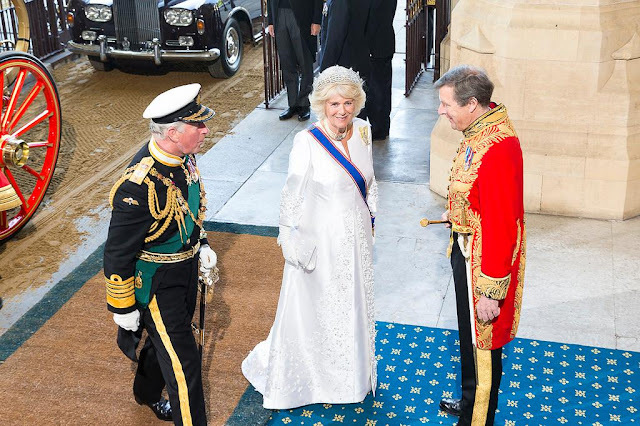 We added The Duchess of Cornwall's jewels to our scope here earlier this year, as she and The Prince of Wales were approaching their tenth wedding anniversary. I've loved sharing a few of her favorites with you, and I'm looking forward to more in 2016! She kicked things off in classic style, attending the first state banquet of the year in the Greville Tiara and her Four Strand Pearl Choker with Large Diamond Clasp with her favorite pair of pearl earrings. Wearing a dress she's used for the State Opening of Parliament in the past, this kicked off a run of white tiara appearances for the year. 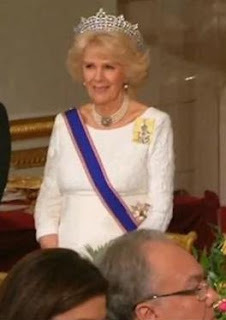 The same jewel combo made a repeat for the State Opening of Parliament, but she did wear an interesting geometric brooch to anchor her Royal Victorian Order sash at her shoulder. Completing her run of State Opening-worthy appearances with the same pearl set and the same white dress worn in March, she made the first of those "bonus" tiara appearances at a Royal Academy of Arts event. This was the only tiara appearance of the year not to feature the Greville Tiara (she went instead with her family diadem, the Cubitt-Shand Tiara), so it was a bonus in more than one way. June ended up being a prosperous tiara month, as Camilla returned to her favorite diadem to mark the bicentenary of the Battle of Waterloo at Apsley House. This also counts as a bonus tiara event in more than one way, delivering her second appearance in the magnificent Greville Festoon Necklace, which she wore with her Diamond Pear Drop Demi-Parure Earrings. It was her most sparkling appearance of the year. The Duchess wrapped things up in Malta with that trusty Greville Tiara and her Five Strand Pearl Choker with Pink Topaz Clasp and Pink Topaz and Diamond Earrings. On sheer diamond power alone, I'd be tempted to name the Waterloo Banquet as my favorite of her 2015 tiara appearances, but pairing my beloved pink topaz gems beautifully with a soft gray dress might just sneak in to steal the title. So: Five! That's not shabby at all, especially when you consider that she missed two of her usual tiara opportunities (she and The Prince of Wales did not attend the Chinese State Banquet and, she had to pull out of the Diplomatic Reception due to neck and back issues). Still, I am ever greedy for more, and I can't help but cross my fingers for just a little bit more variety in 2016. Which will you crown the best tiara moment for The Duchess of Cornwall in 2015? Ah! This must be why she avoided colored stones in so many of her tiara appearances this year; see, she wore them ALL AT ONCE, right off the bat. She debuted this extravagant set in February, and while we haven't covered this massive set here, I discussed possible origins when I covered this appearance on the other blog. She can pull this stuff off like no other, that's for sure.